Multilayer plastic injection molding (sometimes called co-injection molding) involves injecting two resins into one mold at the same time. The core material is surrounded on both sides by the skin material and then simultaneously pushed through the injection gate or nozzle into the mold, creating a three-layer product in the same amount of time it would take to make a single product using the typical monolayer injection process. Multilayer injection molding holds a lot of potential for cutting down the manufacturing time for thick, multilayer products such as lenses for automotive headlights. In an article published in Plastics Technology in January 2015, authors Christian Maier, Georg Steinbichler, and Josef Giessauf explore a new approach to multilayer injection molding that could significantly reduce the time needed to manufacture automotive lighting. We summarize their findings below in an effort to anticipate the potential benefits for creating headlight lenses through this new plastic injection molding process. In their article “Try Multilayer Injection for Efficient Molding of Thick-Walled Lenses,” Maier, Steinbichler, and Giessauf explain existing multilayer injection molding processes. For example, one can overmold a first layer on either one or both sides of a product, or use an interlayer to bond together two previously separate layers. Several thin layers will obviously cool faster than one thick layer, a phenomenon which the authors claim can increase productivity by approximately a factor of two. This greater productivity further decreases the costs of manufacturing thick-walled parts like automotive lighting via multilayer injection molding. However, these existing multilayer techniques still require the part to cool for several minutes. Thus, the authors propose a new method of cooling multilayer products in order to solve this problem. Currently, manufacturers wait to end the cooling period until the preform and top layers of a multilayered product have fallen below the glass-transition temperature. Despite this common practice, Maier, Steinbichler, and Giessauf argue that tests have shown that the preform can be removed much earlier. Instead, the authors advocate for a cooling stage outside the mold between the injection shots. While they acknowledge that cooling in the air requires more time than cooling in the mold, they claim that this choice does not influence cycle time. Instead, during overmolding the preform can have a lower average temperature (vs. conventional sandwich technology), depending on the duration of the external cooling. Because of the lower average temperature, the preform absorbs more heat from the top layers of the part. This cuts down on the product’s cooling time — a result than can be amplified by increasing the thickness of the preform while simultaneously making the top layers thinner. Maier, Steinbichler, and Giessauf describe their new process as follows. First, a preform (1) that has been cooled to a predefined temperature is once again inserted into the mold. As this preform (1) is being overmolded, a new preform (2) is produced either simultaneously or sequentially. The mold is then opened and both the finished overmolded part (1) and the preform (2) are removed. Yet another preform (3), which has until this point been cooling intermediately, is inserted into the mold to be overmolded and become a finished part. The original preform (2) is placed at the station for the intermediate cooling period. This preform —> intermediate cooling —> overmolding process allows three different parts to rotate simultaneously through the various steps of the process. Lenses for automotive lights are challenging to produce since the typical headlamp is 30 millimeters thick. The cooling time for plastic injection molded parts increases with the square of a wall’s thickness, causing the average cycle time of typical monolayer headlights to run at least 20 minutes. Existing multilayer injection processes have already reduced this cycle time but the new approach proposed by Maier, Steinbichler, and Giessauf promises to cut it even further. Reducing cycle time offers several benefits such as faster, more efficient production and lower manufacturing costs. Decreasing cycle times allows for prototypes to be created and iterated much more quickly, minimizing the time needed to move into actually manufacturing automotive lights. 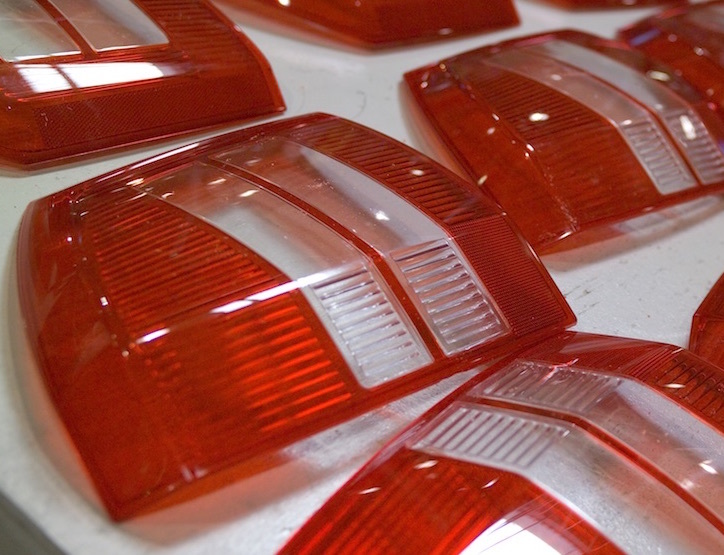 The lower cost of shorter multilayer injection molding cycles also keeps low-volume production runs from being cost-prohibitive, allowing manufacturers to produce only as many headlight lenses as they need. The multilayer injection molding processes offered by companies such as 3-Dimensional Services can help prototyping projects and low-volume production runs become more effective and efficient. 3-Dimensional Services has offices in the Unites States and Germany to service both North American and European clients; please contact us to learn more about our rapid plastic injection molding processes for automotive prototyping and manufacturing.